Thank you Hidden Valley Ranch and DataRank for sponsoring this recipe. I will only endorse companies, products and services that I believe, based on my own experiences, are worthy of endorsement. I’ve been in a rut lately when it comes to cooking for my family. I seem to fix the same things… often. We’re a meat and potato kind of family, but that gets boring. I’m a big fan of Asian food, but tend to go to restaurants to eat it. I was presented the opportunity to try a recipe using one of the new Hidden Valley Ranch flavors from Walmart. I thought the Sweet Chili flavor would be perfect for an Asian inspired recipe. And it most certainly was! 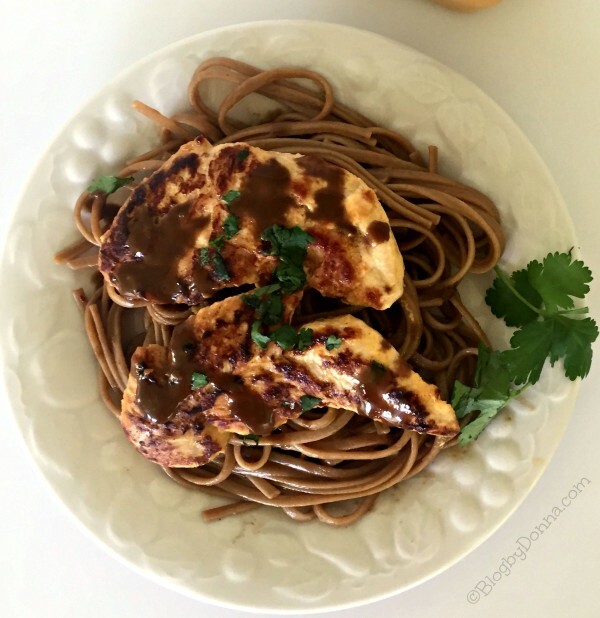 I knew I wanted to use chicken, and pasta is always a hit in my home, so I decided on sweet chili chicken and linguine with a peanut sauce. My husband and I loved it! My son loved the chicken, but I know he doesn’t like peanut butter and wouldn’t like the pasta, so I took a little linguine out before mixing the peanut sauce on ours. When my son compliments food I’ve made, well, it’s a big deal. He’s a picky eater (not as picky as he was when he was younger) and he told me twice how good it was. It’s not a difficult recipe and if you’re like me, you probably have some of the ingredients in your pantry and/or fridge/freezer. Marinade chicken in Hidden Valley Ranch Sweet Chili flavor for at least 30 minutes (I’d recommend 2-3 hours or longer, though). Marinade chicken tenders in 1/2 bottle of Hidden Valley Ranch Sweet Chili dressing for at least 30 minutes. (Go ahead and start pasta – In a large pot of water cook linguine (or spaghetti) according to pasta directions). Turn down heat to low/medium, cover and cook for 7-8 minutes. In a small bowl whisk together Hidden Valley Ranch Sweet Chili dressing, soy sauce, and garlic. Heat for one minute in microwave. While water is boiling for the linguine, work on the peanut sauce. Place all sauce ingredients in a bowl and whisk together (you’ll add reserved pasta water to get the consistency you want). Be sure to not overcook the pasta. It should be al dente. Pour peanut sauce over pasta and mix well. 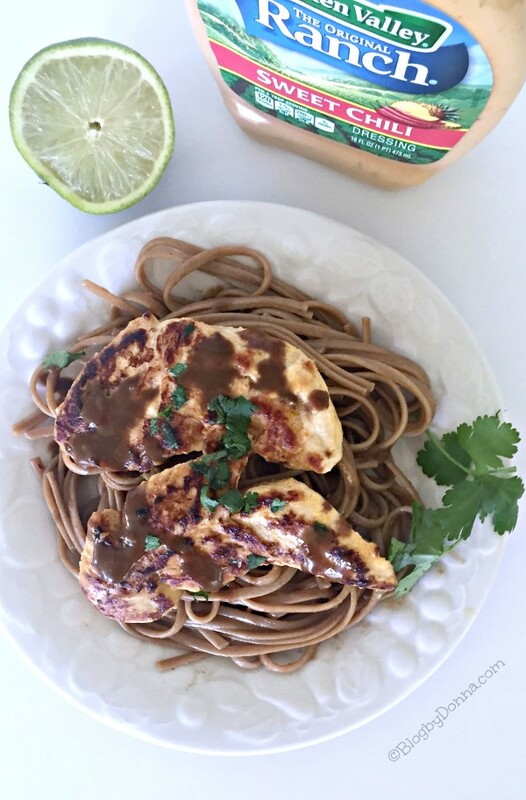 Place sweet chili chicken on top of linguine with peanut sauce, drizzle Sweet Chili sauce over chicken and cilantro. 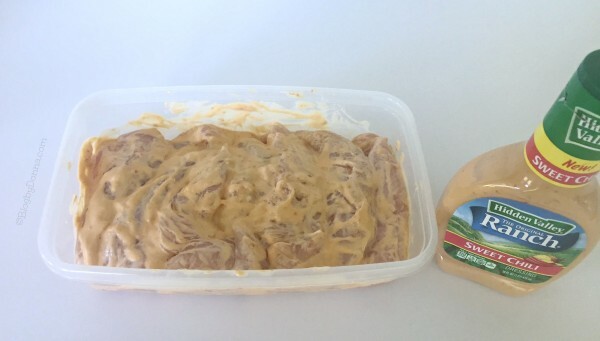 If you want to try something new with lots of flavor, I highly recommend trying the new Hidden Valley Ranch Sweet Chili flavor, I think it would make a great marinade and sauce for any chicken recipe. 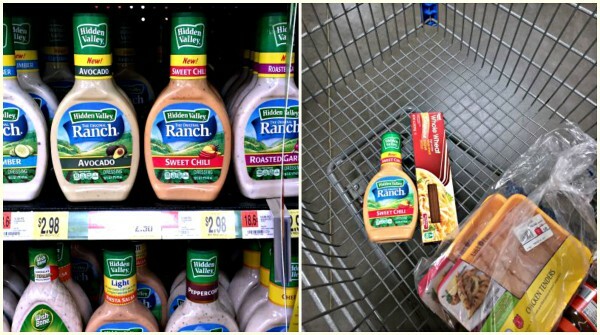 I picked up my bottle of Hidden Valley Ranch Sweet Chili in the dressings/sauces aisle of Walmart. Which flavor are you most excited to try in a recipe? I would love to be able to say that I love this idea….but, I can’t. I am a very finicky eater, and would rather pass on this recipe to family members! The peanut butter sauce sounds interesting. Not sure if the kids would like it though. I bet it smells amazing while it’s cooking! That looks fantastic! I’m a huge fan of meals that are tasty and healthy. I’ll definitely be giving this one a whirl. That sounds delicious. I love the combination of the sweet chili and peanut sauce. Yum! 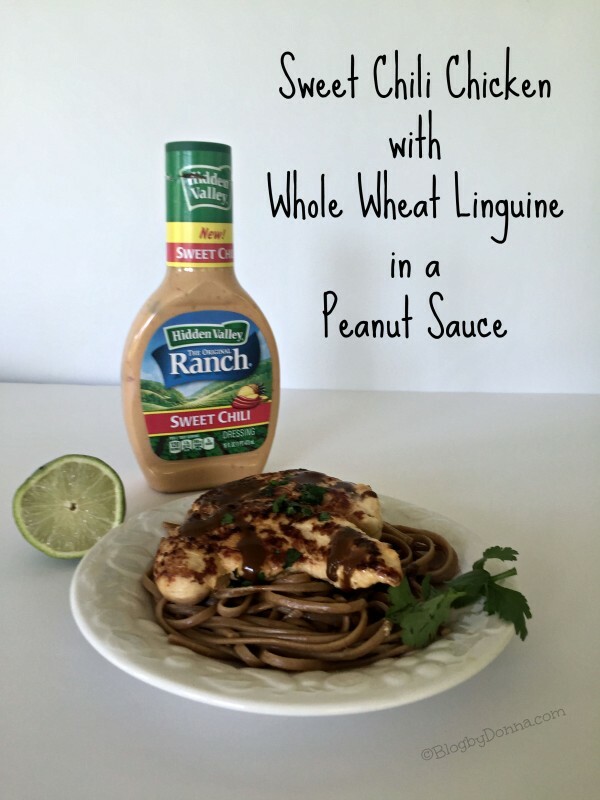 Love peanut sauce in pasta! my kind of meal! I am not into the hot of chili, but my hubby loves it and I know a few others that would be all over this recipe! I will share it with everyone! This looks delicious! I’m always looking for different recipes for chicken. I’ll have to try this one out and hope my daughters love it too! I’ve never had whole wheat linguine before! I’ll have to give it a try. Your recipe looks delicious. Oh that looks delicious. I’ve never tried whole wheat pasta before, I bet it’s just delicious! Yum! I didn’t know Hidden Valley had an Avocado Ranch dressing. I’d make a Southwest Chicken Salad with it. This is such a cool way to use the new sweet chili flavor. The marinated chicken sounds great! A really good unique recipe! I use dressing as a marinade or a sauce sometimes and the combo with linguine is a good to go with it! I love anything with a peanut sauce, so this is something I would really like. It looks easy to make as well. Ahh, peanut sauce on chicken sounds absolutely amazing. And throw in whole wheat linguine just makes it perfect! Great new recipe to try out. Thanks for posting. Wow this looks tasty! I will have to try it out I bet my kids would love it. Sweet chili chicken sounds so delicious! I will have to make this for dinner one night and try it out! This sounds so good Donna! I am not always a big fan of chicken but this is a recipe I would love to try. Thank you! This sounds tasty! I love Hidden Valley, I will have to try this sweet chili sauce. Now this sounds delicious! I am loving these new flavored Hidden Valley Ranch dressings. They are helping to take dinner to a whole new level! I would love to try the Sweet Chili dressing on chicken. This looks like a delicious recipe to try. This looks so delicious and easy to make. I am going to try this tomorrow. I am sure my family will love it. Love a good marinade recipe! I can’t wait to try this one Donna! Thank you! I prefer to let chicken marinate overnight – it really absorbs those flavors! This looks really good. I love finding little ways to make new meals. This sounds like a great dish. I so could see my husband really enjoying this meal! I haven’t been able to get the family on board with the whole wheat pasta. Best I can do is the kind that has a little bit with more fiber and omega’s. This recipe sounds pretty tasty! That peanut sauce! Yum! Pasta is always a crowd pleaser in my house, but it’s nice to mix it up and not serve the same thing again and again. I am such a fan of peanut sauce. I love your addition of the sweet chili dressing. This dish looks really great! Wow!!! What a fabulous idea!!! I have never thought to use ranch to make linguine before. Very interesting mix of flavors. I didnt’ know that Hidden Valley made a sweet Chili sauce. I am pretty excited. It sounds like a great meal for my family. This sounds like a good and simple to make meal. Thank you for sharing and have a nice day. h wow this sounds amazing!! Whoulda thought this was possible with some salad dressing!! Id have never guessed!! For sure tying it asap! Oh my they have Sweet Chili Sauce like dressing that is so awesome. I swear they come up with the best sauces every. I need to try this and the pasta looks extra wheat. Thanks for the recipe.